Gaspa, Salvatore, Cécile Michel & Marie-Louise Nosch (eds.). 2017. 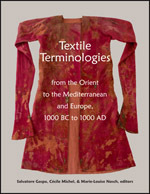 Textile Terminologies from the Orient to the Mediterranean and Europe, 1000 BC to 1000 AD. Lincoln, Nebraska: Zea Books. This volume is the fruit of a longstanding collaboration in the field of textile terminologies. Since 2005, Cécile Michel and Marie-Louise Nosch have collaborated on numerous academic activities – joint teaching, lectures at conferences, experimental workshops, co-publishing and co-editing. The second conference on textile terminology was held in June 2014 at the University of Copenhagen. Around 50 experts from the fields of Ancient History, Indo-European Studies, Semitic Philology, Assyriology, Classical Archaeology, and Terminology from twelve different countries came together at the Centre for Textile Research, to discuss textile terminology, semantic fields of clothing and technology, loan words, and developments of textile terms in Antiquity. Andrés-Toledo, Miguel Ángel. 2017. Sasanian Exegesis of Avestan Textile Terms. Pp. 397-403. König, Götz. 2017. Zur Bekleidung der Krieger im Avesta: Rüstung und magischer Schmuck. Pp. 383-396. Korn, Agnes & Georg Warning. 2017. Armenian karmir, Sogdian karmīr ‘red’, Hebrew karmīl and the Armenian Scale Insect Dye in Antiquity. PP. 173-187.